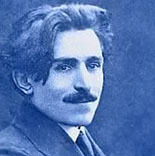 Vahan Terian (January 28, 1885 – January 7, 1920) was an Armenian poet, lyrist and public activist. He is known for his sorrowful, romantic poems, the most famous of which are still read and sung in their musical versions. to order, and held separate by sight. on the same course, but orbits apart.